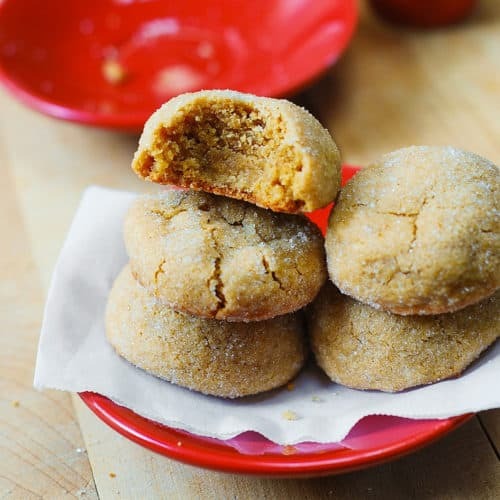 The best peanut butter cookies with an amazing texture. They are also so easy to make! 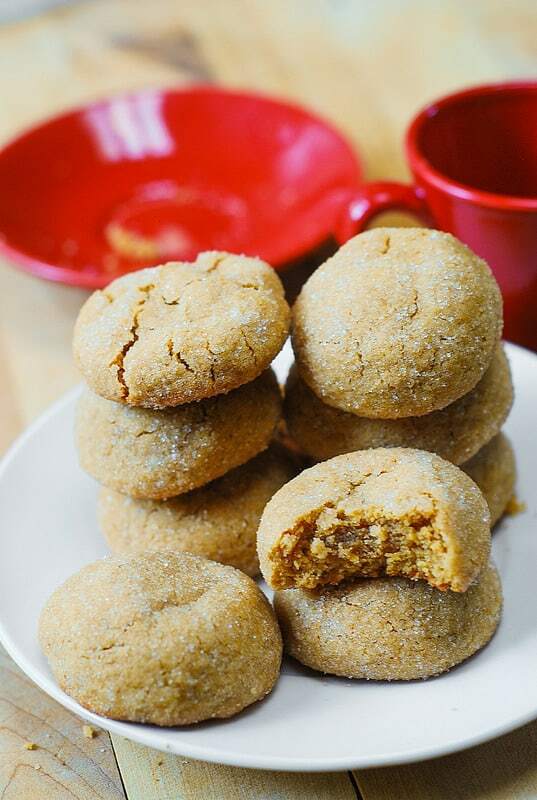 These are truly the best peanut butter cookies I’ve ever tried! It’s not only my opinion – everybody around me loves them too and asks for a recipe! I’ve posted about these cookies last year, and here I am writing about them again! The peanut butter cookies have a perfect brownie-like texture: both chewy and soft at the same time. 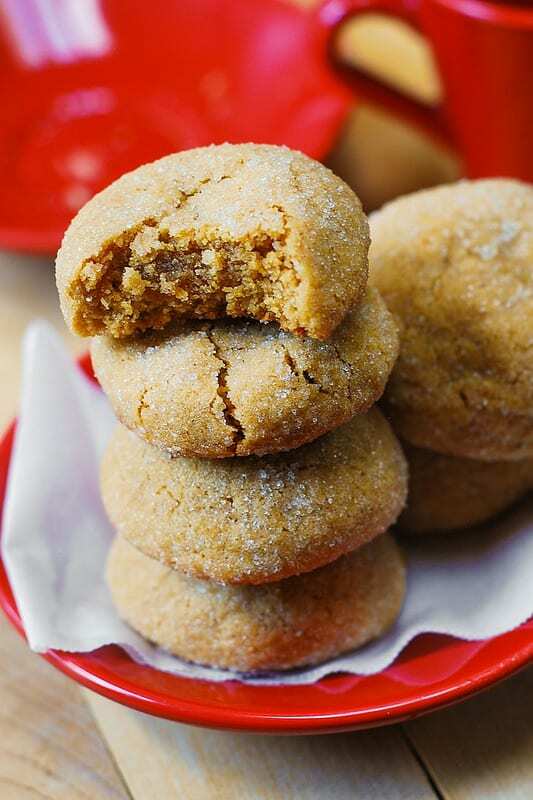 There is just the right amount of peanut butter in these easy peanut butter cookies: not too much and not too little. You can use a regular peanut butter, such as JiF, and you can use natural one too. You can use regular crunchy one and natural crunchy peanut butter. I’ve tried them all, and the recipe works well! If you use natural peanut butter, the cookie will come out just a little bit dryer but the difference is really hardly noticable, if you make sure to sift or aerate your flour (see the note below, under recipe instructions) – it’s very important not to overpack the flour in a measuring cup so that the cookie does not come out dry! 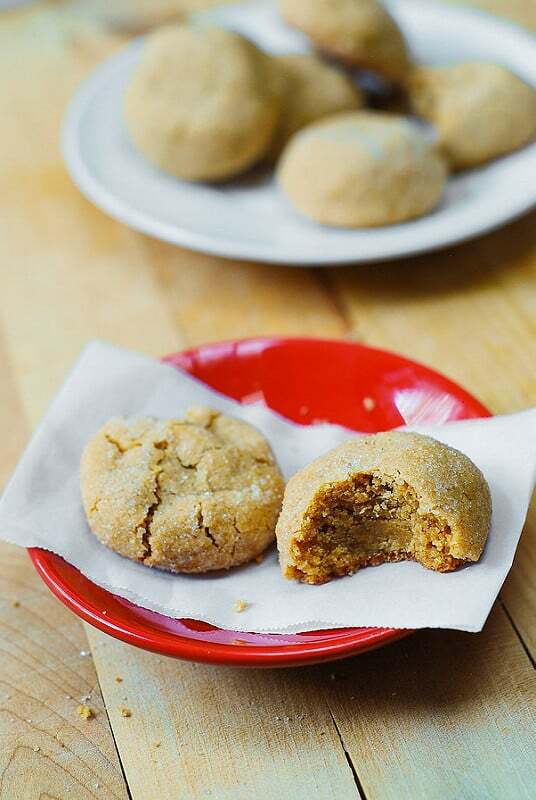 You can definitely taste a peanut butter in this cookie, and yet it’s not like you’re eating overly rich peanut butter cookies. 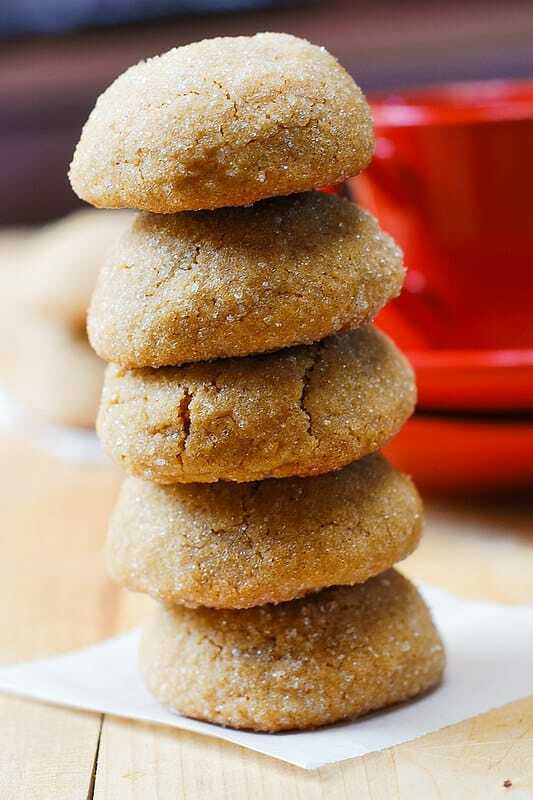 That’s how I like peanut butter cookies, which is why this is the best peanut butter cookie recipe for me! The seemingly unimportant step of rolling these cookies in granulated sugar right before putting them in the oven is the reason why these cookies look so pretty (almost like sugar cookies), why they are light in color and have beautiful cracks on top. Coating these peanut butter cookies in sugar before baking serves two purposes: 1) The cookies acquire lighter, much more attractive color when sugar coated. If you don’t roll these cookies in sugar, they will come out much darker, almost looking like dark peanut butter. Rolled in sugar, the peanut butte cookies come out looking like sugar cookies! 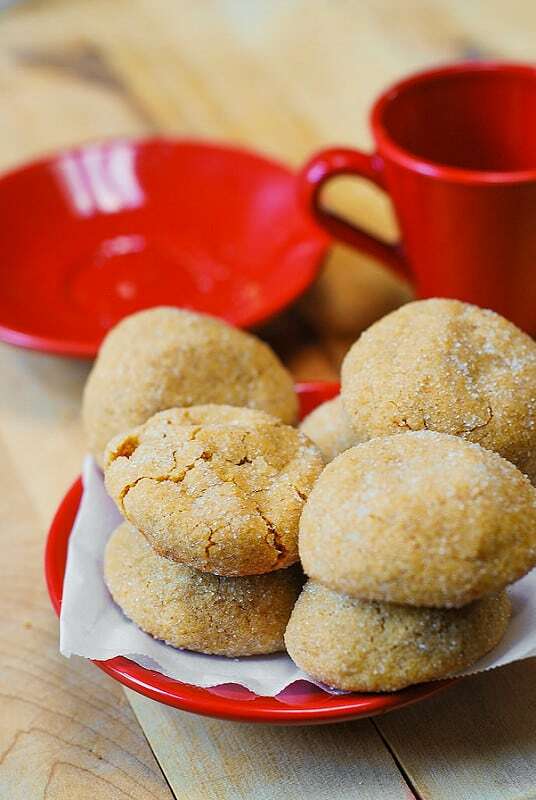 2) Rolling cookies in sugar gives them a nice soft crunch on the outside of the cookie. 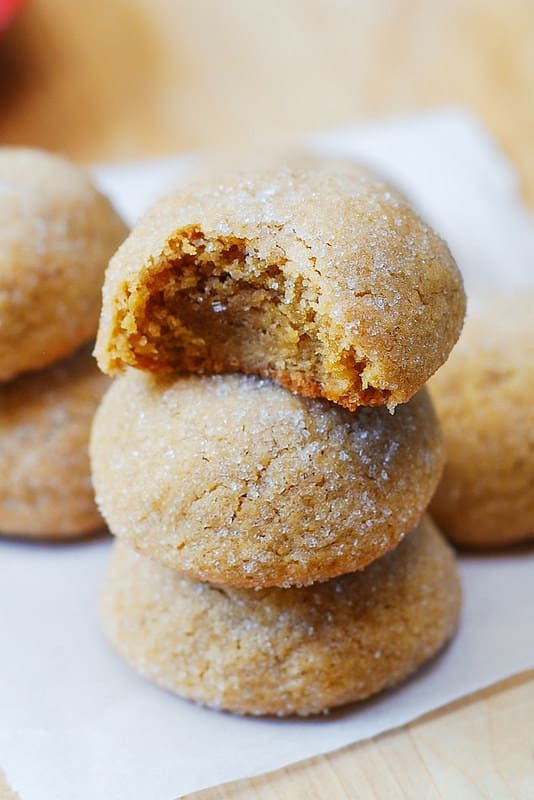 For cookies to have that nicely rounded, puffed up shape, roll them in balls between the palms of your hands and then roll each cookie ball in sugar. If the peanut butter cookie dough is too soft for you to work with, let it chill in the refrigerator for 30 minutes before rolling. 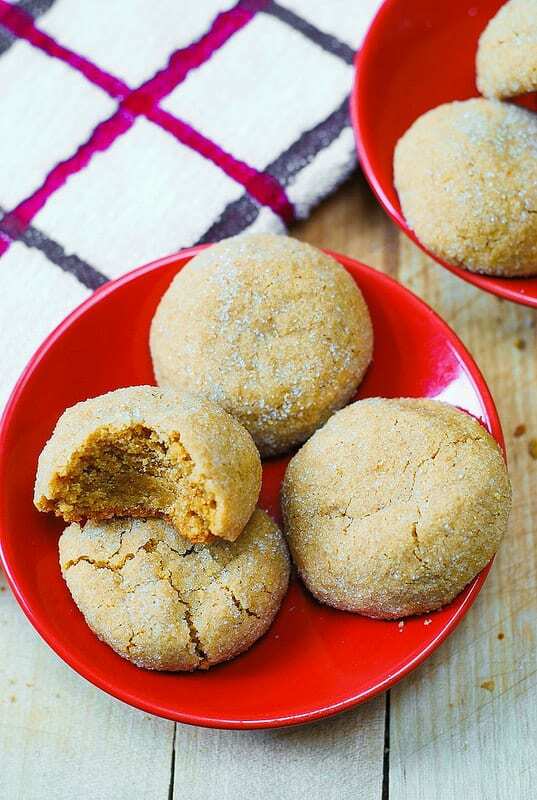 The result are some of the best peanut butter cookies you’ll ever make! Amazingly yummy cookies that are popular with kids and adults alike! They have a moist, almost brownie-like texture and only get better as the days pass by. Keep them in air-tight container and they will last you for up to 2 weeks – that is, if you’re disciplined enough not to eat them all the first day! These easy peanut butter cookies have a perfect brownie-like texture: both chewy and soft at the same time. They are not overly rich peanut butter cookies. 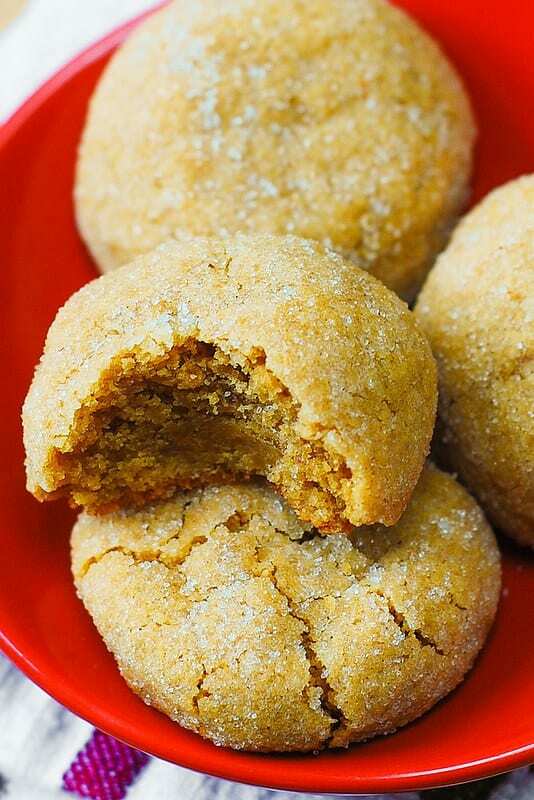 Some of the best peanut butter cookies you'll ever make! Preheat oven to 350 degrees Fahrenheit. Using an electric mixer, cream peanut butter and butter in a mixing bowl until smooth. Add brown sugar; beat until combined. Add an egg and vanilla, and continue beating until creamy. Prepare baking sheet by lining it with parchment paper or lightly greased aluminum foil. Place granulated sugar on a plate. Roll spoonfuls of cookie dough into balls, rolling each ball between your hands. Roll balls in sugar to coat them completely. Place cookie balls 2 inches apart on a prepared baking sheet. Bake until cookies begin to puff up slightly, about 12 minutes, until cookies just brown around the edges and crackle on top. Remove from oven and let the cookies cool at least 10 minutes on baking sheet before transferring cookies to rack to cool completely. Recipe is adapted from Martha Stewart. Do you use light brown sugar or dark brown surface? Is there a difference ?? I used light brown sugar but I don’t think it makes any difference. You can use either. 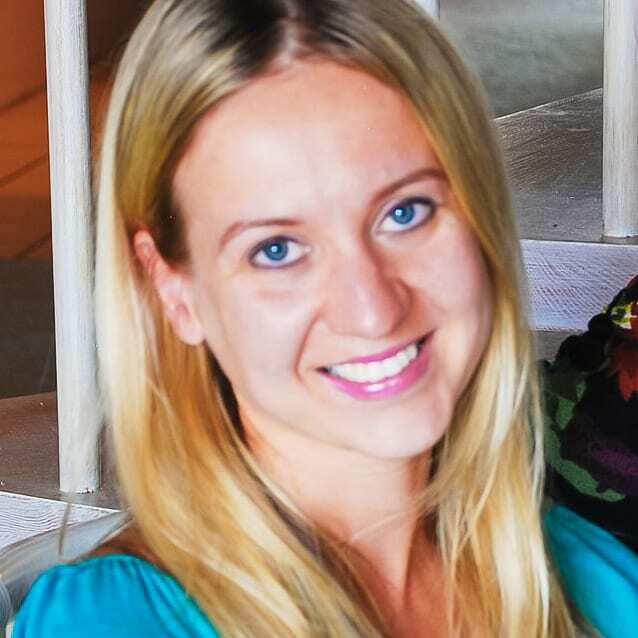 So happy to read comments like yours! So glad you enjoyed this recipe! That’s exactly what I like about it – it’s not overwhelming with the peanut butter flavor. These are yummy! I doubled the amount of peanut butter and rolled them in chocolate sprinkles instead! So glad you enjoyed these cookies! There just wasn’t a lot of peanut butter taste which was disappointing. I followed the recipe and aerated the flour but they ended up just not being very sweet or full of peanut butter flavor.